Today’s blog post is brought to you by our Video Marketing Specialist, Andrea Kalli. The popularity and effectiveness of video marketing continues to experience exponential growth. While the concept of video advertising is not new, its integration into website and mobile content has rapidly become a powerful marketing strategy. Every business — from small to large — needs to incorporate video in all of its advertising outlets, including website, mobile, email, and social media. Take a look at the following reasons you should develop a video marketing strategy. 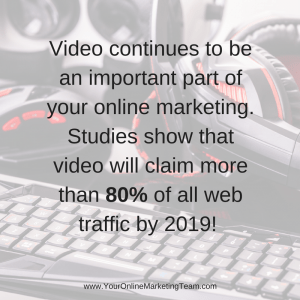 It is estimated that 80 percent of the Internet traffic will be video by 2019. If you have not yet incorporated video into your marketing structure, you have no time to waste catching up. Now is the time to determine the type of video content essential to reach the diversity in your consumer base, and build a team to create and execute the strategy needed to accomplish the project. It’s important to track your ROI from all marketing content in order to maintain a viable strategy going forward. Over 50 percent of marketing professionals have determined the importance of increasing the amount of video content based on ROI results. Video analytics software shows marketers how much of the content was viewed and the geographical location of the viewing. This type of information can assist marketers in determining which sets of people and locations are best suited to specific video content, resulting in an increased ROI. The retention rate for video content is considerably more than that for its text-based counterpart. Retention is a critical component of a success-driven marketing campaign. Compelling content will stick in the consumer’s mind and influence their purchasing decisions. Statistics show the majority of consumers watch more than 75 percent of a video. Work the most important content of your campaign into the first half of the video. Video content has been proven to be preferred by consumers and marketers, as well. Its versatility makes it the perfect content for websites, mobile marketing, and email campaigns. Video is versatile and effective. Several minutes of video can be the basis of a number of campaigns. Video can be sectioned and combined with other segments to create a whole new communication. It can easily be geared for several demographics by shifting the content around. Because of video’s ability to be reused in numerous ways, it is considered to be highly cost-effective. People get tired of opening emails with lengthy content that takes five minutes of reading to get to the point, and busy people tend to ignore that type of marketing. Video is a powerful medium for communicating with your customers and clients. By placing the word “video” in the subject line, the open rate increases by 20 percent. Videos inserted in your email can include a new product introduction, tutorial, sale items, and educational information. Video content makes your email stand out from the rest by providing interesting and valuable content. As more statistics become available there are some prominent facts developing that emphasize the importance of including video in your marketing going forward. Business to business (B2B) and business to consumer (B2C) professional marketing firms site video as one of the top three effective social media and marketing strategies. Nearly 35 percent of tablet users watch in excess of an hour a day of videos. Be sure your two- or three-minute video is being watched. Over 85 million smartphone users regularly watch video on their mobile device. A huge number depend on their smartphone and video to help them with making purchases because they provide a quick glance and overview of a product or service. Not sure how to get started with video marketing? Let me make this part easy for you. While you can go crazy creating videos left and right, the best approach is to tackle the 3 most important video categories every business should have. Welcome Video for your website home page – Use this video to greet visitors and let them know who you are, what you’re about, and how you can help them. Don’t make this too long. A goal of 3 minutes or less is ideal. This is your virtual handshake. It’s big-smile time! Product or Service Description Videos – OK, so there will probably a few of these. Creating a video for each product and each service is what you’re going for. Focus on one thing at a time. Here is where you describe the pain your solution solves, and how their life will change when they get your product or service. It’s all about benefits, benefits, BENEFITS! The Top Ten – These are the top 10 frequently asked questions you hear about your business. As before, you want a short video to answer each and every question. The length can range from less than 30 seconds to a few minutes. Take whatever time you need to be clear in your answers, without rambling. Short and sweet, but extremely informative. By delivering clear goals and valuable takeaways you will begin creating an ultimate fan base for your business. 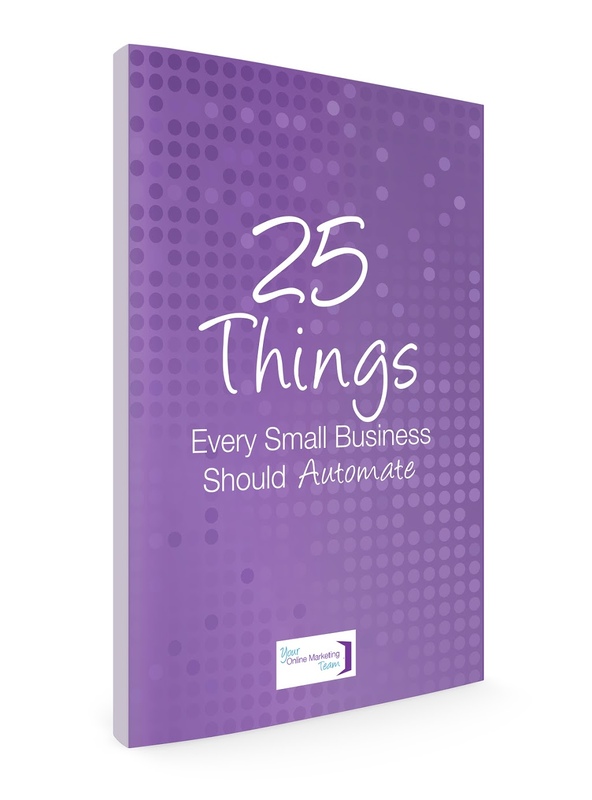 Once you have these done, then branch out to create even more videos for your business. There really is no limit to how you can incorporate video into your business messaging and marketing. Now is the time to start incorporating video marketing into your online marketing strategy. Its popularity and success is already proven. Don’t let your marketing team put it off another day. Schedule your free call to see how Your Online Marketing Team can help you with video!